Why do we want you to have a signature; Wanderlodge Owners Group > Frequently Asked Questions > User Related Issues What is the signature for?
" Lastly, we would ask that you sign your posts with your name, coach type and year, this can be easily done by using the signature box in your profile." 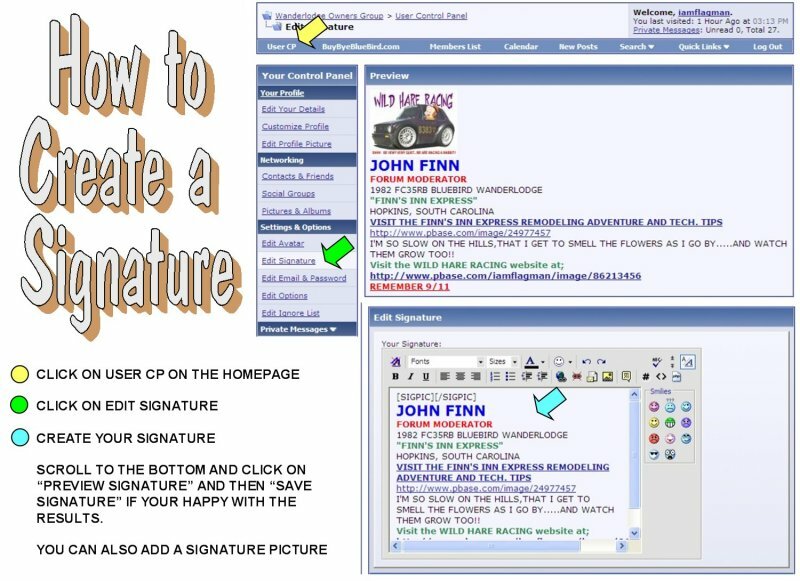 You can set your signature by choosing User CP at the upper left side of the forums page and then choose Edits Signature from the Settings & Options, then create your signature and if you want to you can add a signature photo, then scroll to the bottom and click on Preview Signature and if you are satisfied with the results, then scroll back down to the bottom and click on Save Signature. Another reason to add your location to the signature is that way if you are in need of any help, we can try to direct you to another member close by. Once you get your signature set up, it will be automatically added to each of your posted messages so that you won't have to remember to do it ever again. You may turn the signature on and off on posts you have already made by editing the post and altering the state of the "Show Signature" option, we prefer that you choose to show your signature in all of your posts.